President-elect Donald Trump is claiming credit for a planned $50 billion investment in the United States by a Japanese tech conglomerate -- a deal he says wouldn't have happened without him. But the reality appears to be a bit more complicated than that. The huge sum has been pledged by Masayoshi Son, the colorful billionaire founder of SoftBank (SFTBF), a Japanese telecom giant that has pumped money into U.S. wireless carrier Sprint (S) and a range of other tech businesses. 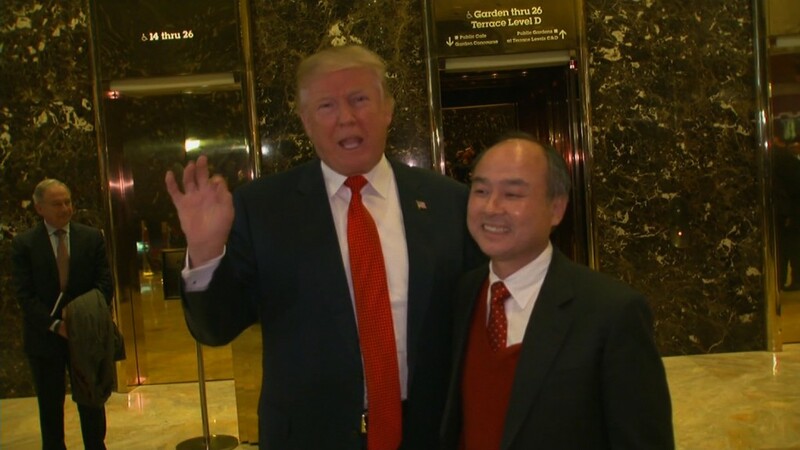 Son met with Trump in New York on Tuesday, after which the president-elect tweeted that the Japanese tycoon "has agreed to invest $50 billion in the U.S. toward businesses and 50,000 new jobs." "Masa said he would never do this had we (Trump) not won the election!" Trump said. But in October, weeks before the election, SoftBank and the government of Saudi Arabia announced plans to form a $100 billion fund to invest in technology companies around the world. Son told The Wall Street Journal in an interview that the money he promised Trump would come from the huge fund. A spokesman for SoftBank in Tokyo declined to comment further, saying he couldn't provide any details beyond what Son had said in New York. The U.S. is home to Silicon Valley, which is widely regarded as the world's top startup environment, so it seems likely that some of the fund's money would have ended up in the country anyway. Speaking with reporters on Tuesday, Son said he told Trump he would like to "celebrate his presidential job" by investing in "startup companies" in the U.S. He said the reason was that Trump has made deregulation part of his platform. That could be a reference to Son's failed attempt in 2014 to merge Sprint with T-Mobile (TMUS), which ran into regulatory hurdles. SoftBank paid more than $20 billion to take control of Sprint in 2012 and has struggled to turn the U.S. carrier around. News of Son's meeting with Trump gave a lift to all three companies' shares. Softbank shares in Tokyo jumped 6%. In the U.S., T-Mobile gained 1.8% and Sprint rose 1.5%. "We cannot say whether the situation has changed, but meeting with Mr. Trump certainly created the possibility of discussing the merger that was rejected before," said Jun Tanabe, a telecoms analyst at JPMorgan in Tokyo. "This is certainly a step ahead." Tanabe said he was "stunned" how quickly Son was able to meet with the president-elect. Son's meeting at Trump Tower also cast attention on the U.S. plans of Foxconn, a major Apple (AAPL) supplier based in Taiwan. 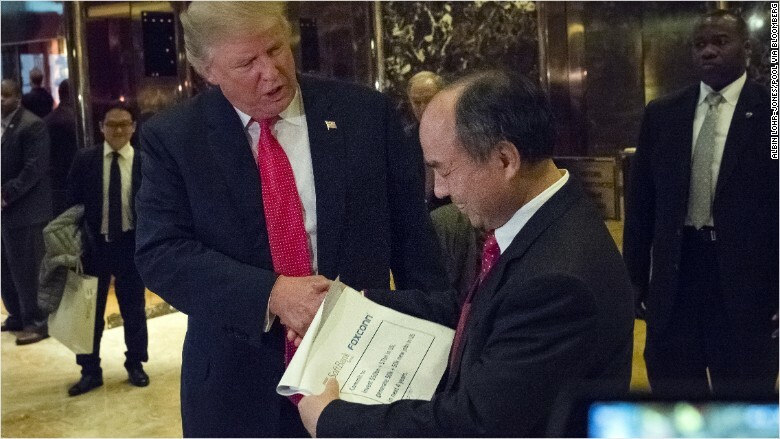 Photos showed Son holding a document with both the SoftBank and Foxconn logos at the top. "Commit to: Invest $50bn + $7bn in US, generate 50k + 50k new jobs in US in next 4 years," the document said. Asked about the document, Foxconn said it was in "preliminary discussions regarding a potential investment that would represent an expansion of our current U.S. operations." But it didn't provide details, saying "the scope of the potential investment has not been determined." Related: Apple supplier Foxconn is in talks to invest in the U.S. It wasn't clear why Son was carrying a document with Foxconn's name on it. The two companies are separate but have partnered on robotics. Son is known to be friends with Foxconn's founder, Terry Gou. SoftBank funds have already invested in some highly-valued tech startups across the globe. Among them: personal finance firm SoFi and Uber competitors Ola in India, Grab in Southeast Asia and Didi Chuxing in China, according to PitchBook. Uber sold its Chinese operations to Didi earlier this year. SoftBank is one of the largest telecommunications companies in Japan, and was the first Japanese cell phone carrier to sell the iPhone. It was also an early investor in the Chinese e-commerce giant Alibaba. In July, it snapped up top British tech firm ARM Holdings for $32 billion. Son, the company's outspoken CEO, put together a 300-year plan for SoftBank that calls for it to help permanently break down language barriers and allow people to communicate telepathically. --Sara Ashley O'Brien and Yoko Wakatsuki contributed to this report.